London was at the centre of attention last summer, as Olympians the world over descended upon the UK capital to pit their wits against each other in the quest for gold. If you watched any of the track-and-field events, you probably noticed the neon yellow-green footwear donned by many of the athletes – well, chances are these were Nike’s Flyknit Racer and Trainer models. Not cheap, sure, but for folk wishing to try and emulate their heroes, the sports retail giant made versions available to the public too. And today, Nike officially launches the Flyknit Lunar1+, the next incarnation in its Flyknit range aimed squarely at non-elite athletes. As its name suggests, the Lunar1+ follows in the footsteps (pardon the pun) of its Flyknit predecessors, which first launched in February last year. The whole underlying ethos is about precision fitting, with the support and structure knitted into the material, meaning no seams, reduced weight and less friction. 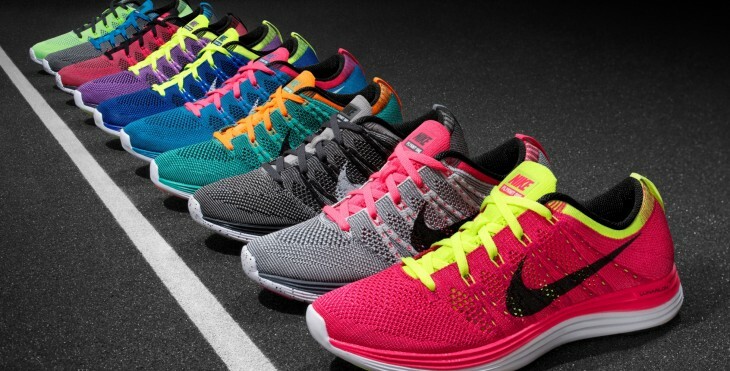 With the Lunar1+, however, Nike is taking Flyknit to a broader range of runners. Indeed, it’s aiming at those looking for a “neutral platform” and a light, well-cushioned shoe. At around 226 grams, the Lunar1+ shoes are very light, but not quite on the same level as the more pro-focused Racer range, which weighed closer to the 160 grams mark (depending on size). There are many similarities between its predecessors, the Nike Flyknit Racer and Nike Flyknit Trainer, namely that the upper section of the Lunar1+ is created without any cutting – it’s just one piece of material. Of course, Nike is eager to point this out, given the environmental impact of wasted material. So while elite marathon runners have achieved near world-record winning times in Nike Flyknit Racer, the Lunar1+ is aimed more at the likes of you and me…assuming you’d consider running a marathon, that is. The shoe is available for sale now globally, costing £140 (UK), and $160/€160 respectively – so yeah, they’re not cheap. But if you’re looking for the best gear on the market, well, they’re certainly worth a look if you have cash to burn. It’s at this point we’ll take a look at another neat new piece of Nike tech. Its Steam Lounge. Timed to coincide with the launch of the new Lunar1+, Nike is also offering a new service alongside it – a steam machine that properly fits the shoe to the shape of your foot. While it already offers a similar service for football (soccer) boots, this is the first time such a service has been made available to the public for standard athletic footwear. The only machine currently available globally is in London’s Niketown, though one will also be arriving shortly in its flagship New York store and, presumably, further afield too. The premise is simple – you select your size of footwear, and confirm your plan to purchase. Staff will then put your new Flyknit shoes in this portable sauna for 30 seconds to moisten them up, and then mould them around your foot. A key benefit here, too, is that each shoe can be fitted to suit slight differences between your right and left foot. It’s also worth noting here that the machine will work with any Flyknit shoe, and you can take ones you’ve bought online into the store to be steam-fitted for free. Nike’s showing no signs of slowing in its quest to own the tech-fitness space. With the launch of the Nike+ Fuelband last year, this was swiftly followed by the Nike+ Training and Basketball apps, which were designed to work with special Nike+ connected shoes. And then Nike launched its latest offensive to take tech to millions of homes around the world, with Nike+ Kinect Training. Whether you’re a fan of Nike’s efforts or not, there’s no getting away from it. With the recent launch of the Nike+ API developer portal, ahead of its startup accelerator (yup) next month, the sports retail giant is really pushing to bridge the divide between the old world order, and the new tech-obsessed fitness community. Indeed, in many ways Nike is fueling it, alongisde others such as Fitbit. Now, with uber-lightweight, steam-fitted running shoes in its bag of tricks, the Nike tech bandwagon rolls on.